RMS' cost-effective demand letters are guaranteed to achieve your goals. Letters sent by RMS are often powerful enough to secure payment from your past-due in full accounts quickly and effectively. They can also help to avoid more expensive contingent collection efforts. Our solution set of debtor-demand services provides the opportunity to get your payment request paid by leveraging RMS' collection services. RMS' demand letters are available as a series of two letters. Printed on our letterhead, they have a professional appearance and have been worded to maximize collection efforts. 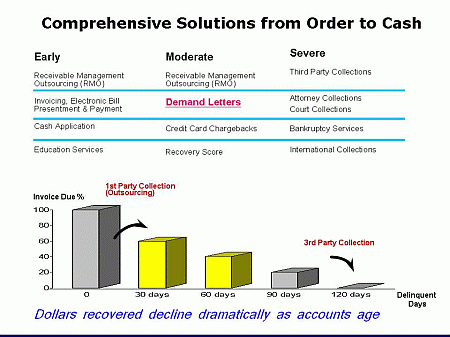 A typical DunsDemands letter is ideal for collecting smaller delinquent balances as well as modestly past-due accounts. All recovered payments will be sent to you directly at no extra charges or commission on top of the service fee.